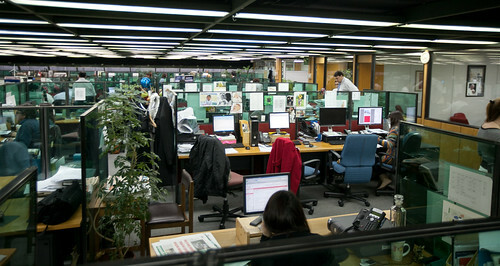 El Mercurio Newsroom, by JD Lasica. We use language and communication so much that sometimes we take it for granted. ‘Media’, ‘mediation’ – when we look at these words, it’s all but impossible to note the exact first 5 letters. This is no coincidence. They both derive from the noun, ‘medium‘. Digging further gets you to a Proto-Indian root, ‘*medhyo‘, something you can drill further down into if you wish. It’s an interesting history in not words, but concepts and thoughts. Medium has been used to describe, ‘intermediate agency, channel of communication’ since around 1600. The basis of ‘media’ and ‘mediate’ is medium. Are they so different in concept? In theory, no. In practice these days, it’s hard to say. As mentioned before, I took the first level of training in Mediation at the Conflict Resolution and Media Center of Trinidad and Tobago, and after hours I began thinking about the common etymology of ‘media’ and ‘mediate’ which got us to where we are, here. Yet when I look at the two as they are now, through a fresh lens, that seems to be the only way in which they are linked other than through some serendipity. Mediation is a confidential process that works toward resolution of conflict through communication facilitated by a neutral third party. I did learn a few things. Media, on the other hand, has come to mean any communication over one or more mediums. Newspapers use paper and literacy, radio uses sound and radio frequencies, television uses sound, video technologies, and sometimes literacy, and the Internet combines all of these to varying extents. ‘Social Media’ is redundant, really, because all media is social – it’s really media that allows easier feedback, and these day, allows things to be shared faster than other forms of media, driven by interests of users. ‘Media’ encapsulates entertainment, education, and news. However, these days, we hear it used in the context of ‘news’ a lot. The lines between entertainment, education and news have blurred with the ‘talking heads’ and the prevalence of bias to sell advertising or simply to keep it. So when we hear about ‘The Media’ in this context, it’s about a specific use of the media. It’s about what we are given as news. And journalism is where ‘news’ is supposed to come from, or where we say it’s supposed to come from. 1690s, “one whose work is to write or edit public journals or newspapers,” from French journaliste. As A.J. Liebling wrote, “Freedom of the press is guaranteed only to those who own one.” The Internet gave everyone with access to the Internet access to such a press. To publish publicly without a media organization, potentially publishing things less biased by advertisers – but then, to make money, advertising became necessary, and all that happened was the atomizing of the same business model. What all of this really gets to, though, is an phrase attributed to Edmund Burke, supposedly used in a debate in 1787 when the House of Commons of Great Britain was opened to the press. the journalistic profession or its members; the press. a group other than the usual powers, as the three estates of France, that wields influence in the politics of a country. The first definition fit better before the Internet, where there was a more substantial difference between journalists and the general public. The second definition fits better in modern times, where we can all publish. And there you have the link between journalism and the public as it shifts in one definition. These days, the more popular what you share is, the more influence you have – for better or worse. What others share that you have demonstrates how much influence you have as well – a closed circuit. Thus, if we can get past definitions of ‘journalist’ and ‘journalism’, words doomed to a period when journalists broadcast instead of interacted, we get back to us all being a part of the Fourth Estate. But what does this all have to do with mediation? Not that much right now, it seems, and yet, maybe it should. The Fourth Estate is necessarily not confidential, but maybe it could be more neutral. Maybe that’s what they should have in common. Maybe that ‘neutral third party’ should be everyone publishing to some metaphorical public journal. Maybe we should all be facilitating facts instead of regurgitating hearsay – after all, hearsay is heresy. When it comes to the media in the context of news, people need to be informed. They want to be entertained. The two are separate. Publishers are the ‘media’, journalists are not the media unless they self-publish. If they don’t self-publish, they just work for the media. With the atomization of the Fourth Estate, anyone who publishes has a greater responsibility when using their influence. In these ways and more, we might get ‘media’ and ‘mediation’ to make more sense together when we see those common five letters.